The final choice of a design for the diploma incorporated the Coat-of-Arms of the City of Melbourne with its motto Vires Acquirit Eundo*, from an engraved die. 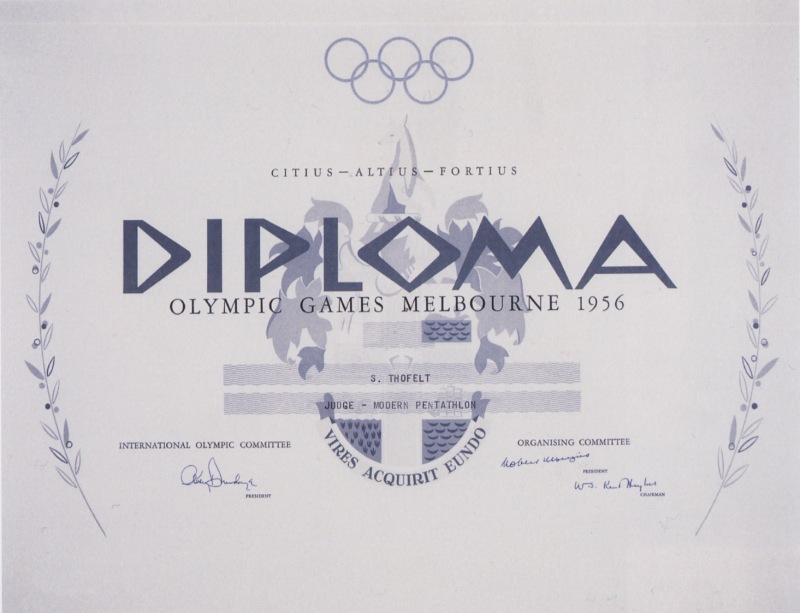 Imposed over the Coat-of-Arms was the Olympic motto, then the words " Diploma Olympic Games Melbourne 1956," and below these were three lines left for details of place, event and name to be completed. Beneath the main design were the signatures of Mr. Avery Brundage, the Right Honourable R. G. Menzies, and the Honourable W. S. Kent Hughes, with two branches of wattle surrounding the whole. The Olympic rings were in the top centre, printed in silver and embossed. The inks used were non-greasy moisture set in four shades of grey with black, and blue-black for signatures. The over-all size of the diploma was 23 inches wide by 17½ inches deep, and printed by letterpress on pure white arctic ivory paper. Four thousand were ordered. The original intention was to handwrite the details on each diploma, but due to the numbers involved a faster method was sought and a leading typewriter company produced a machine with specially large type (3/16 of an inch) which was found to be satisfactory and had the advantage of speed and economy. (1) First to sixth individual place-getters, and members of teams placed one to six. (3) International Federation officials if certified by their Federations. Both the latter points should have been settled before teams and Federations left Melbourne. Diplomas were individually packed in cardboard tubes and sent in bundles of approximately 20 to each National Olympic Committee. Unfortunately some were lost in transit and others damaged ; all were replaced. In the light of experience a smaller diploma would probably have travelled more safely and in better condition.